JTJB Deputy Managing Partner spoke on the topic “Breaking Down the Dispute Resolution Clause” on Thursday, 22 October 2015. John shared his views on choosing the preferred way to settle disputes. He provided a detailed explanation of the elements making up the clause, the importance of options as well as the cost saving techniques available. It was an informative seminar which ended with networking over tea. JTJB’s Commercial Dispute Resolution Practice Group handles litigation, domestic and international arbitration and offers a full range of dispute resolution services. 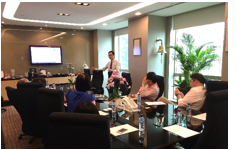 For more information about the seminar, please contact John Sze at johnsze@jtjb.com. ADVOC is a leading international network of independent law firms, with 90 members in 66 countries worldwide. JTJB is the only Singapore member of ADVOC group and was pleased to host the 3rd ADVOC Maritime Conference on Thursday, 8th October 2015 at the Singapore Cricket Club for the second consecutive year. The conference consisted of 2 panel discussions and 1 keynote address. JTJB Senior Partner, Dato’ Jude P Benny was the conference chairman. The speakers at the Conference were JTJB Managing Partner, K Murali Pany, JTJB Deputy Managing Partner, John Sze, Charles Hattersley, Partner of Ashfords LLP, United Kingdom, Neil Klein, Partner of McKasson & Klein LLP, United States, Mats Segolson, Vice President and Head of Claims of Skuld, Singapore and Nick Treen, Marine Engineer Consultant of London Offshore Consultants. We were honored to have Mr. Kesavapany as our Keynote Speaker. Mr Kesavapany spoke about “Changing Global Dynamics and Its Impact on the Shipping Industry”. The Conference ended with cocktails and networking at Stumps. We would like to thank all the speakers and delegates for participating in the 3rd ADVOC Maritime Conference 2015. Click here to view more photos taken from the event. JTJB’s Shipping & Admiralty Practice Group is one of the most experienced shipping practices in Asia, and is a key area of practice at our firm. For more information on the conference topics, please feel free to contact Murali Pany at murali@jtjb.com or John Sze at johnsze@jtjb.com. 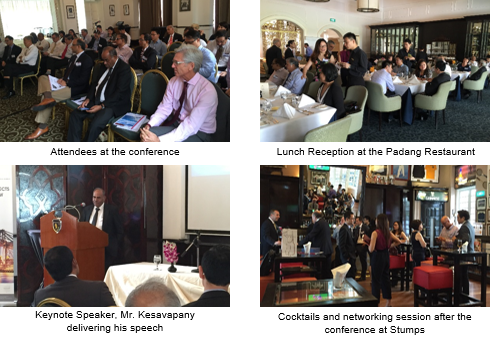 JTJB was pleased to be a sponsor of the Singapore Chamber of Maritime Arbitration (SCMA)’s Annual Conference held on Friday, 23rd October 2015. In recognition of Singapore’s 50th anniversary, the conference focused on the country’s evolution in the last 50 years, where we are headed and how SCMA can best position itself to benefit from these changes. The conference featured mock sessions on mediation and arbitration together with supporting panel discussions. JTJB’s senior partner, Dato’ Jude P Benny chaired in the second panel discussion on “Reflections and Crystal Ball Gazing: Asian Arbitration Development – 50 years past and future”. JTJB’s Commercial Dispute Resolution Practice Group handles litigation, domestic and international arbitration and offers a full range of dispute resolution services. For arbitration and litigation matters, please contact Dato Jude Benny at judebenny@jtjb.com. Rahayu Partnership has expanded its corporate and commercial team with the addition of Junior Partner, Noor Asyikin Binti Mohd Bahrudin. New Associates, Wan Yusni Adila Binti Wan Mohd Yusoff and Nor Anisa Binti Muhamad Radzi also joined the team recently. The corporate and commercial team has recently acted in several high profile projects at state, national and international levels including advising on a multi-billion Ringgit highway project involving a contractor from the ENR Top 250 Global Contractors list and acting in a tri-partite agreement involving a yearly supply of more than 30 million barrels of crude oil into South East Asia. For more information about Rahayu Partnership, feel free to send your enquiries to info.kl@jtjb.com. Celebrating its 10th Anniversary this year, JTJB Bangkok has recently launched its newly revamped website. Click here to visit the website. For more information about JTJB International Lawyers Co., Ltd, feel free to send your enquiries to info.bangkok@jtjb.com.